The Iron Age is normally the third era of prehistoric and early historic times named after the material used for the production of tools in the simple division of the three-period system, following the Stone Age and the Bronze Age. In this time, iron began to be used for tools and weapons. The Iron Age is followed by the Antiquity or Protohistory, depending on the culture group. The beginning of written records defines the beginning of Protohistory. The beginning of iron smelting and metallurgy therefore is atttributed to prehistoric times in some regions (i.e. Central and Northern Europe), while in others it is attributed to protohistoric times (Mediterraneum area, Middle East, China and India). The Hittites (Asia Minor) knew how to process this metal at a time in which it was not yet done in other areas of the world. With the end of the Hittite Empire, it lost the monopoly it held over the smelting of iron, which had been practiced there since the 17th century BC. After the 12th century, this technique spread over the Middle East and the Mediterranean region. The Altai Sayan Highlands and the Minusinsk Basin in Central Asia are adjacent to the Eurasian Steppe belt, which was settled by nomadic tribes. In this plane landscape with rivers, vast fields and a continental climate, conditions were ideal for animal husbandry. Ever since the beginning of the early Iron Age and the Bronze Age, nomads have settled in these steppes (grassland) between the Pannonian Basin in Hungary (also known as the Carpathian Basin) and the Yellow Sea (China) (see steppe map). These steppe peoples did not have their own script, which is why information on these civilizations has to be deduced from archaeological studies. By the end of the 1st millennium BC, changes in homogenous burial forms had taken place, probably due to immigrations of other civilizations. According to archaeological and anthropological data, cultural and ethnic mingling had occurred. 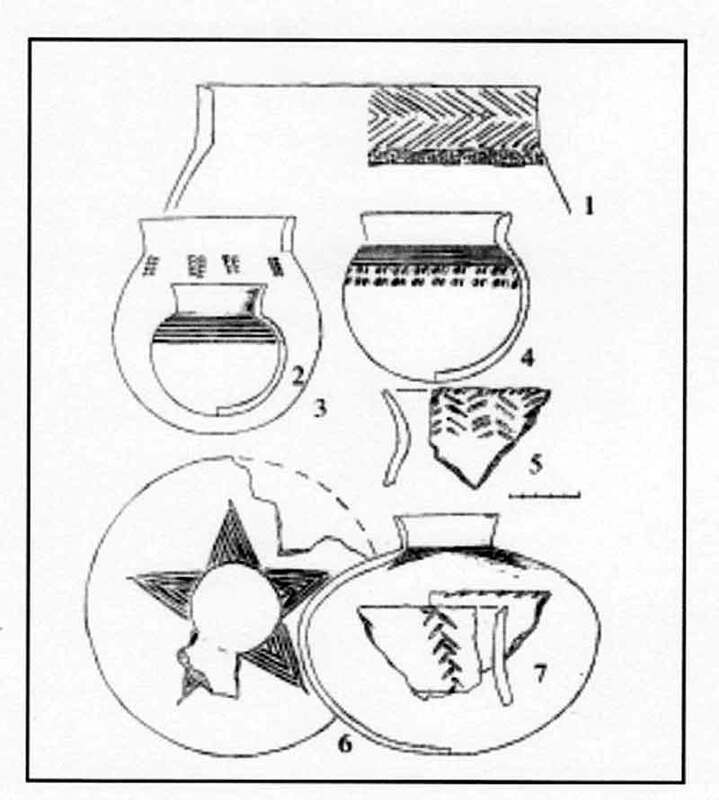 Immigration into the central Yenisei area (Minusinsk Basin and contemporary Tuva) introduced new shapes to clothing, jewelry and tools. It is believed that tribes from the west penetrated into what used to be the area of settlement for the Xiongnu and the Rouran (1) at the time. It is possible that these new tribes invaded from the south and undermined tribes that had been settling there for a long time. It is the first time that collective burials appear. A cemetery found from the late Tagar culture (2) contained more than 100 skeletons in the same pit, many of which were incomplete, although all of them must have been buried at once (mass grave). In excavations, bodies were found that had been processed in some way, separated parts had been buried successively. Trepanations of a kind were also found, which can be attributed to the late Tagar culture at Kyzyl Kum from the 3rd and 2nd centuries BC. Large holes in the parietal bones of the skulls suggest manipulation that probably took place post mortem. Soft parts were removed from the brain in connection with some form of death-mask production. These “trepanated” skulls (trepanations) were filled with clay and later coated with plaster and covered again. Trepanation rituals of this type were very common cults in the Central Asian area. Perhaps mutual spiritual beliefs and ritual routines were characteristic for such cults at the end of the 1st millennium BC. It seems probable that the tribes who practiced these kinds of rituals are derived from the same genetic origin  as was discovered in burial objects, bodies and trepanations. These very old customs must have had at least some connection to the Bronze Age, and they extend back to the time of the Eurasian steppes, where similar ritual behaviors occurred in burials, i.e. where trepanations with soft-part removal, death-mask preparation and separation of body parts had been practiced. It is possible that similar world views and the idea of an afterlife promoted these types of burial traditions in the steppes. 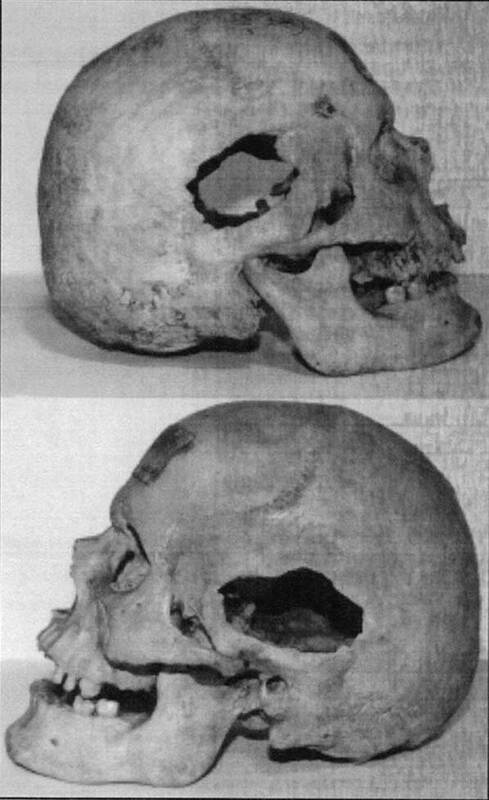 According to finds in southern and western regions in Siberia, it appears that in northwestern Mongolia and Central Kazakhstan relationships extended down to the Minusinsk Basin, where this unique burial technique had been practiced at a very early stage, including trepanation, the production of plaster masks, and embalming, which has survived in some primeval tribal civilizations. It is not probable that these routines have come to existence for reasons of medicine. Comparable pre-historic finds coming to light around Lake Baikal can probably be ascribed to the ancestors of the Yakuts, the Quryqan (Rouran  Ruan Ruan  Juan Juan), who settled in the Altai as contemporaries of the Xiongnu. Amulets were produced from human skulls, as can be seen in finds in the northwest of Mongolia, in Tuva, in Central Kazakhstan and around the Altai. Trepanations were common at the time. The death cult associated with burial objects was a common tradition within nomadic societies. There was a material relationship between the deceased and their descendants (ancestor cult). Parts of the skullcap were processed into amulets or otherwise worn as keepsakes to remember the dead. Primarily, this was a ritual of major importance where skulls were connected to an ancestor cult and where a tradition including death masks, embalmment and mummification was pursued. Skulls were used for rituals associated with these death cults or to intimidate defeated enemies. Decapitations and subsequent skull representations served as proof of a victory over the enemy. These trepanations were found in the Saglynskaya culture in Tuva and in the Pazyryk culture (1) in the High Altai, and they can doubtless be interpreted as a sequence in rituals including embalming. The trepanations in Ulaangom, Mongolia, and examples from Central Kazakhstan had either been performed intravitally (i.e. on living persons) or post mortem (on dead bodies). Decorated skulls were popular burial objects, as ancient oriental finds demonstrate. Methods of such trepanations were scraping, stitching, drilling or cutting out rectangular crossing incisions. The technique of scraping was probably among the most common methods and used from ancient Egypt until the Italian Renaissance. The techniques of drilling and cutting were found in Peru. A method in which four straight cuts were made, was also known in the Neolithic Age in France and in the territories of Palestine and Africa during the Iron Age, and is still being used in Kenya. 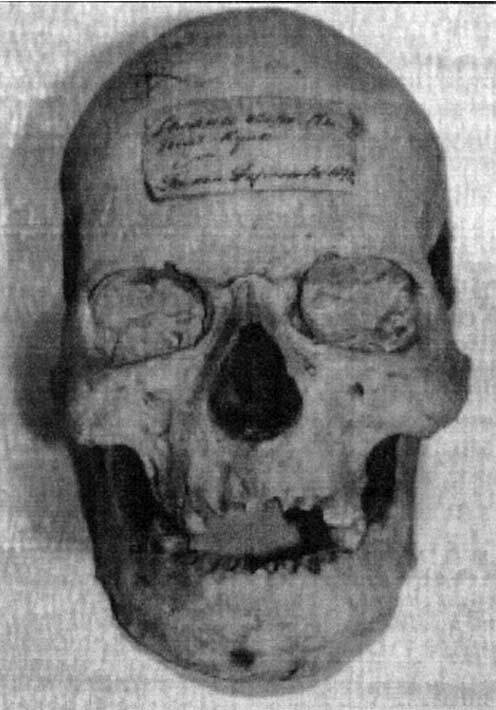 Celesius described such skull manipulations from Roman times. The technique was adopted from the Arabs, where it became common standard up until the Middle Ages (see Skulls 1 + 2). Processing and mummifying the dead seems to have been a widely common phenomenon in South Siberia in late prehistorical times. Mummified bodies were found in tombs of the Pazyryk culture of the High Altai. Evidence of burials from the last period of the Tagar culture and in the Minusinsk Basin have been identified as such. Various forms of mummification with practices of a secondary burial were common in South Siberia and in a late period of the Scythian era. The term “Scythian world” was coined by a group of archaeologists to define civilizations from the 8th to 3rd centuries BC, referring to tribes who predominantly stayed in steppes, in forest steppes, on hills and in mountain valleys. Finds in Ukraine, Siberia, central Kazakhstan, Mongolia and the northern part of China included similar pit constructions with burial objects. The Uyuk culture in Tuva, named after the river Uyuk, where first scientific excavations in tumuli were evaluated, was also a civilization of the Scythian-world type. It was located on the way between Abakan and Kyzil. Handcrafts from this Scythian time found in burial sites show that here in this highland steppe a pastoral economy was pursued on a semi-nomadic basis, with winter and summer pastures (as in the Alps). The necessities of life were complemented by hunting and gathering. Fighting (war) played an important role within societies, as revealed by a great variety of weapons used as burial objects. The Uyuk culture was accompanied by two other civilizations from this Scythian era, the Pazyryk culture in the west and the Tagar culture in the north. These cemeteries were used by the tribes who settled here for several generations. First burials originate in the Bronze Age, while more recent burials can be dated back to the 18th century AD. A majority of burials are part of a Scythian time, the largest percentage being from the 3rd to 2nd centuries BC. Finds can be ascribed to a Hunno-Sarmatian (Tashtyk) time ranging from the 1st century BC to the 2nd century AD. Mummified bodies were found in burials of the Uyuk culture, the Pazyryk culture of the High Altai and the Tagar culture in the Minusinsk Basin. Archaeologists have declared them as part of the Scythian culture (era). This is a civilization similar to the Eurasian-steppe, semi-nomadic civilization regarding its spiritual world views and economic customs (husbandry and agriculture). In this Scythian World, weapons, harnesses and handicrafts were influenced by the animal style. Other components like habitation, burials, ceramics, objects of daily use and jewelry had minor differences. As a result, one cannot speak of a single Scythian civilization but has to accept various differences, as a family relationship to “Eurasian” tribes existed. Neighboring tribes were involved in similar material and spiritual world views while retaining a regional originality. It would be more appropriate to speak of a Scythian epoch. These tribes settled in the Eurasian steppe zone in relatively monotonous and forest-free landscapes, the ecological preconditions of which were the same in the distant steppes of Hungary in the west and in the planes of Mongolia in the east. This grassland shared borders in the north with Eastern European forests and the Siberian Taiga. Further east, these steppes are bounded by the Caspian Sea, Lake Aral and the Kazakh sand desert. The Pamir and the Altai-Sayan Mountains constitute southeastern borders. Furthermore, this Scythian World was no Central Asian state but rather a loose confederation of nomadic tribes and their clans. During this period other tribes also appeared who belonged to this Scythian epoch. Being of differing genetic origin, they were designated Saka, and they lived in these vast Eurasian steppes from the Bronze Age onwards. They mainly settled in the Volga-Ural region and in the semi-deserts in the south near Lake Aral. They spoke an Indo-Iranian language, and they exerted a major influence in the steppe area. Their tribes performed a mixed agriculture that included cultivation of land and animal husbandry. In addition, they lived on hunting, gathering and fishing, they bred domestic animals, and they grew plants that were maintained using simple irrigation devices. Animal husbandry and agriculture were the most important economic systems in this period. Similarities between a material and a spiritual world view could be observed. Based on ecological conditions comparable to other regions, their position was highly advanced in terms of economic development. Favorable topographical conditions lacking major obstacles favored direct interaction between adjacent tribes. From the Bronze Age, tools, implements and decoratively processed objects made of stone, bone, wood and bronze were found, their shapes resembling the animal style. In the second half of the 2nd millennium BC, these objects supported the traditional life form of the steppe population and served as their ecological basis. Certain elements of a material civilization were characteristic of steppe inhabitants at the time. Similarities in finds from various regions in burial sites, such as in the periphery of the Caucasus Mountains, in the southern territories of the Republic of Uzbekistan, of Tajikistan and Turkmenistan, made a number of archaeologists and anthropologists confirm a migration theory that included lengthy migrations of people from the European steppes, Central Asia, Northern India and the Iranian highlands towards the south in the late 2nd millennium BC. The earliest finds of harnesses from this period show that at least in the late Bronze Age, the steppe people practiced horseriding and were therefore able to cover considerable distances. During the 8th to 7th centuries BC, the population specialized in a nomadic life-style with herds. Burials at the cemeteries of Aymyrlyg in Tuva, South Siberia clearly show crop marks in skeleton remains as a result of gutting (removal of soft parts, organs etc.) and dismemberments that are unlikely to be associated with the consummation of dead bodies (i.e. no cannibalism was involved). The manipulation and mummification of the dead seems to have been a widely common phenomenon in the area of southern Siberia. It is believed that the custom emerged together with a tradition of building sepulchers, which necessitated mummification in order to preserve the body during the construction time of the vault in its original form. Once the brain and the soft parts had been removed, the skull and the body of the dead person were filled with dirt, fir needles and larch cones. treated in this way and stored for six months after the person’s death. The Yakuts, too, knew these dummies (4), in which spirits could be captured or dead souls could live. (1) Before the Russians arrived, the Koryaks lived in patriarchal large families. Among them were both nomadic, reindeer-breeding groups and resident groups who lived on hunting and whale-hunting. The Koryaks are a people on the peninsula of Kamchatka in the far east of Russia. (2) The term Samoyedic peoples (Samodi peoples, Samoyeds, Samojadj) comprises the peoples, populations or groups of people who used Samoyedic languages in history or in the present. If combined with the linguistically related Finno-Ugrian peoples, the proper generic term is Uralic peoples or the Uralic family of peoples. The Samoyedic peoples include the Nenets (Yurak Samoyeds, Yuraks), the Enets, the Nganasan (Tawgi Samoyeds), and the Selkup. The latter are the remaining southern Samoyeds who lived in parts of central and southern Siberia until the 19th century. Some of the ancestors of the Kamasins and other Siberian Turkic peoples were related to the Samoyeds. The Mator (or Motor) were a Samoyedic ethnic group that perished during the 19th century. The Nenets live on the Yamal Peninsula and in the northeast of the European part of Russia. The Nganasan or Tawgi and Awam Samoyeds include only about one thousand people. They live between the lower Yenissei and Khatanga Gulf on the peninsula of Taymyr. (3) The Finno-Ugrian ethnic group of the Khanty (former name: “Ostyaks”) speaks a Ugrian language that is part of the Finno-Ugrian branch of the Uralic languages: the Khanty language, which can be divided into four dialects. Along with the Mansi people, they are referred to as Ob-Ugrians, and they are the indigenous population of their region. In linguistic terms they are the closest living relatives of the Hungarians. Initially being horse breeders from the upper Irtysh river, they became hunters and reindeer breeders and came into contact with Russians in the 11th century. In the 16th century, they fell under Russian rule. It was only in the 18th century that the Khantyzation of the Khanty began. Their cultural existence is threatened by the oil industry in the area. 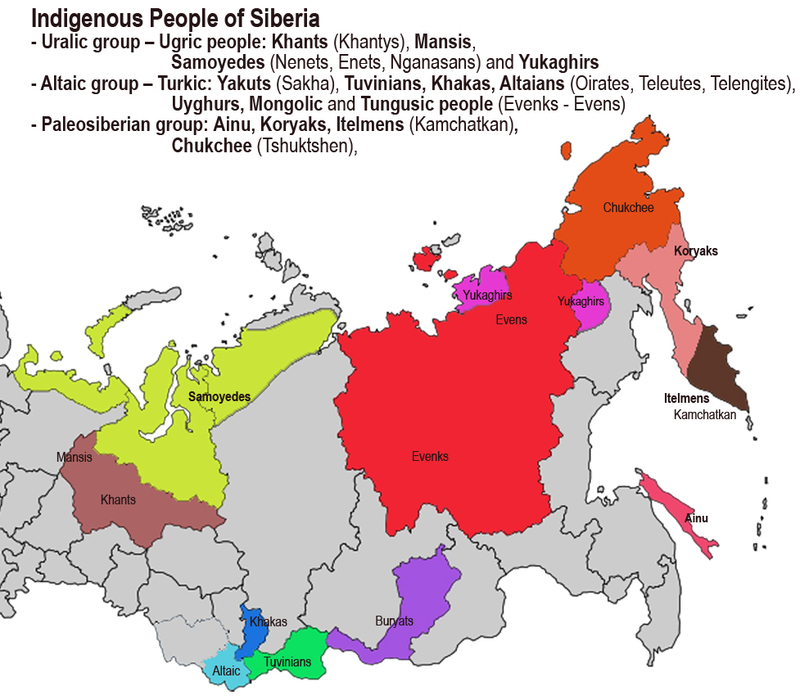 - more information on the indigenous peoples of Siberia: see map "Indigenous People of Siberia"
- a paper on indigenous people, small peoples of Siberia is currently under construction! (4) Human beings are inhabited by two spirits (souls), one of which effects physical procedures, while the other is responsible for the psychological ones. The latter turns into the spirit of death when somebody dies. In order to protect oneself against his stalking, humanlike figurines are shaped out of wood, into which the shaman places the dead soul by magic before packing them into a small birch-bark bag. The bag is hung in a corner of the house and sacrificed to. The figurine of the former female shaman “Makyny-Kysa-Tynyraxtax Kägäi”, who has been playing a fury-like character ever since her death, is found in particularly many representations. She is carved out of wood and dressed in fur. Even though the shaman has banned her spirit into this dummy, it continues to be dangerous to touch this idol, which is usually put on the bar above the chimney, facing north. The wrath of this creature that should not even be named, the furor of this doll “Kys-Tangara” (“virgin goddess”), could erupt any moment to commit evil. Also, the Yakuts say that the spirit that is in every object presents itself in the object’s shadow. Chinese chronicles contain descriptions on how the Turks practiced seasonal burials in the 6th through 8th centuries AD. They say that people who died in spring or summer were buried in cemeteries only in the fall when the leaves on trees and the plants turned yellow and began to  yes, fall. Only when nature fell and died, the deceased were also ready to be buried for good. Those who “died” in late fall, in winter or when the leaves were beginning to open had to wait until next fall. They were temporarily buried in the snow for preservation, without any artificial processing, as they were buried and maintained in a relatively unchanged and fairly intact condition. When spring came, the corpses were processed, including those that had passed away from late spring to early fall. In these mountainous areas it was necessary to prepare corpses temporarily until they could be buried for good, in order to protect them from the natural decay during the summer heat. Ways of processing developed, including the removal of soft parts and the dismemberment of bodies to keep them safely in a piece of cloth, a sack or a leather bag, until they were finally buried when the groups returned to the most important tribal cemetery in Aymyrlyg in autumn. Storage and maintenance of the disassembled bodies and bones before their final burial had another purpose: that of burying tribe members in their ancestral graves together with the souls of their ancestors. This might be due to the spiritual, religious tradition in which this cult was practiced during the Scythian period as a means of preserving the human shape for the afterlife. This, as noted in ethnographic reports, has been recounted by descendants of tribes in the eastern taiga, where the belief prevailed that two souls live in a human being, one of which remains within the skeleton. This idea explains such burial practices for maintaining the soul of the deceased in his dead body. The descriptions were accurate at Scythian times, and they had a direct analogy to earlier phases of mummification of dead bodies in the Minusinsk Basin. It is also probable that the routine of secondary burial and mummification, which was present with all semi-nomadic tribes of the southern Siberian regions, were practiced at least during the Scythian era. This routine no longer had any meaning during the subsequent Hunno-Sarmatian period (Tashtyk). Descriptions in Greek sources regarding nomadic tribes revealed that Sauromatae settled at the lower Volga in the southern Ural in the 6th through 4th centuries BC. They also settled close to the Black Sea and the Sea of Azov as well as at the lower Don after an invasion on Sarmatian tribes. The term Sauromatae covers various ethnical groups who were descendants of Bronze-Age steppe nomads that settled in the western territory with covered carts and herds. They inhabited the eastern steppes of the Don, the left bank of the Volga river and the southern Ural during the 8th and 7th centuries BC. In archeological finds at the lower Volga and southern Ural, burial objects with handicrafts, ceramics, arrowheads, daggers and swords (1) were found. These demonstrate that this civilization may not be considered a homogenous one, as records describe such nomadic burial sites from the Don to the Ural Mountains as parts of the Sauromatian culture. It was first believed that the Sarmatians were derived from the Sauromatae. Finds dated back to the 6th through 4th centuries BC at the lower Volga and the southern Ural had been ascribed to a period of the Sarmatian culture before, being hardly different from a Scythian culture in the area of the Eurasian steppe (the Saka from the area around Lake Aral), apart from a few local variations (originality). The peoples of the north produced heavy quivers, while those in the south used light-weight, elegant trilobite arrowheads. Diametrical heavy arrowheads with pins are typical for the first group but were not found at the lower Volga. Localization of mobile offering tables made of stone and massive arrowheads confirms the existence of an autonomous Samara-Ural settlement area with animal-style handicrafts. The fire ritual in cemeteries was characteristic in both regions. In the grave, the head of the deceased was oriented towards the west, he was laid on his back. The burial structures of several hills in the south are exceptional. They have sepulchers made of wood that have round or rectangular constructions beneath hills, which displayed traces of a wake on the old ground or in the dromos (the entrance passage leading to the morgue). Sometimes a horse or a guard was buried to accompany the deceased. Funerals were collective (mass grave) and could be reused several times. Mounds of earth were characteristic, although some graves were partially built out of stone. The burials found in the south of Ural contained both horse and sheep bones as burial objects, while at the lower Volga, sheep bones were much more common. All ceramic types have flat bottoms. The clay of the pots at the lower Volga was coarser. Almost all pots are unilateral, and many are asymmetrical with uneven edges and bottoms. They have thick walls and particularly heavy massive bottoms. Combinations of various ornaments on a single pot were relatively rare. The most popular shapes are plain fingernail ornaments. 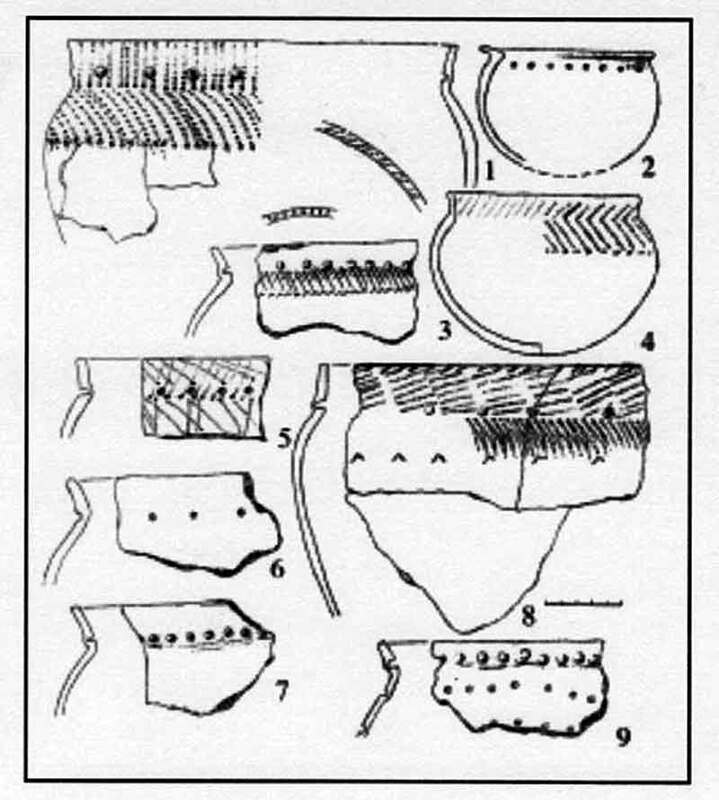 In the southern Ural two groups of pots can be identified. 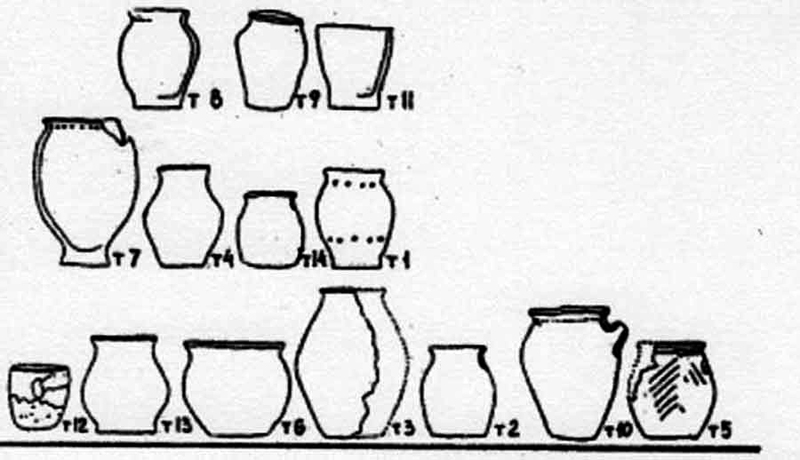 Round-bottom pots represent the first group. They were found seldom in the Scythian time period (6th to 4th centuries BC), as a round-bottom vessel marks the subsequent early Sarmatian ceramic in the southern Ural. The same ornament was not found of the southern-Ural type and on that from the lower Volga region. This confirms that the Uralic ceramic is unique in its ornamentation. Simpler ornaments are characteristic of the Volga ceramic vessels, including nail impressions, fingers, etc. decorated with simple patterns. The Uralic pottery was familiar with a much more versatile shape, compressed U-shaped motives, arches and triangles, and unevenly gobbled geometrical shapes. Arrowheads were narrower and longer. Changes in ornamentation of this kind can in any case have been initiated by a west-bound migration between the southern Ural and the lower Volga. Swords having zoomorphic motives such as, for example, a pair of raptor heads on the pommel, were also found (the pommel is the end of the sword; it joins the handle and the blade), as were swords with horse heads in cast ornaments, in which two opposing raptors form a handle with their helical beaks. Swords and daggers were present in two types. A larger number of swords belong to the group used in the European Scythian culture. They were very popular in the southern Ural as well, however not very common, as finds at the lower Volga show. They appear in analogy to numerous swords and daggers found in Siberia and Central Asia. Another type of swords from southern Ural has characteristic features that existed in regions in the east but not in the lower Volga region. Animal-like motives were not found at the lower Volga and in the southern Ural. 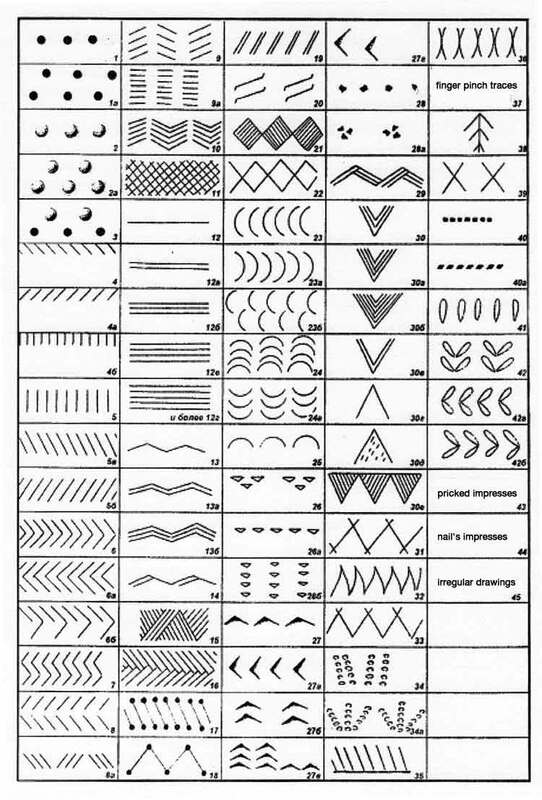 Characteristic features of the motives in ornamentation at the lower Volga were complex geometrical shapes in connection with zoomorphic representations. The image of a wolf was most common in the southern Ural, where they had a decorative art with a simplicity of technique and larger and less complex constructions, in which the unity of the surface design was characterized by expressiveness and contour. While at the lower Volga, they preferably used wedge carving, artworks in cast bronze are characteristic of the southern Ural (see drawings  1). Kurgans were not only active cemeteries (morgues), they also had complex architectural structures reflecting artistic and cosmological ideas of a society. A variety of constructions and interior designs with burial objects of the settlers of the steppe and forest-steppe zone can be discerned. This could point to the fact that even nomads had solid winter housings at protected places, where the influence of the weather was reduced. Archaeologists who discovered such Eurasian kurgans from the Iron Age have found that large kurgans are mostly built on higher levels in the landscape, i.e. on hills, to be visible from everywhere. This system of positions could have played a role and served as landmarks and orientation aids for nomad tribes. The Kazakh and Kyrgyz people buried their dead exclusively close to their winter fields. The Tuvans buried their dead in the area of mystical places because they believed in a traditionally rooted transmigration of souls (afterlife  rebirth). Clan members were therefore exclusively buried in domestic cemeteries that were built (in winter or summer) within the clan territories. In the southern Ural, memorials or grave sites indicate a different spiritual orientation. The idea of safety must have been adopted from the eastern Siberian peoples. Images of fighting animals with long noses and exposed teeth show a wolf motive in its detailed representation; these images were predominant in the entire Asian territory. Stone plates for marking graves were a specialty in the southern Ural, they are three to four meters high and contain zoomorphic representations (i.e. gods in animal shapes). Drawings showing wild mountain goats (argalis) in the southern Ural resemble those found in the Central Asian area in the steppe of Minusinsk (Minusinsk Basin). Morgue rituals seem to have been of great influence, their origin being in the east. Similar, diagonally and radially oriented wood constructions on hills were found south of Lake Aral and in western Mongolia; they were a number of pear-shaped ceramic vessels with a slightly curved profile and a rounded bottom. Vessels with a cylindrical end were observed, too. Burial objects and burial sites were similar in the eastern and southern sides of the Altai Mountains. Arrowheads with hooks were found in the kurgan of Issyk Kul in Kazahkstan and in the Pazyryk kurgans in the high Altai; they were characteristic of the eastern tribes and also typical in the Ural. These arrowheads were cast in bronze and iron. In Kazakhstan, in the Altai and in southern Siberia, round belt buckles with rectangular or trapezoid frames and rigid hook fronts were more common. Buckles with zoomorphic representations of the same kind were characteristic in sepulchers of these regions. A number of these buckles with zoomorphic representations were found beneath handicrafts in the southern Ural, such as a standing camel, two fighting camels, fight scenes involving predators (a predator tearing another animal apart) and heraldic turtles and griffins.  Ural and Irtysh between the 5th century BC and the 5th century AD. Stock farmers settled in Transuralia between the 7th century BC and the 13th century AD. During this period the bases of their life changed constantly, including the construction of their tenements, their storage pits, their chimneys, objects of every-day use and ceramics. Birch twigs and stocks were used for firing, pine stocks typically served for the construction of buildings. It is possible that the earliest burials were made in parallel with the first buildings and fortresses. The climate was continental and instable (varying greatly). The summer temperatures were high with low rainfall, while winters were very cold, including arctic winds. Bones of domestic animals or hunted wild animals found next to seeds of plants have given some information on the diet of the time. Cattle and horses were kept as domestic animals. Few sheep bones were found, but many dog bones and even complete skeletons and skulls of humans as well as bones of camels, elk, deer, boars, bears, foxes and beavers. Settlements were erected in favorable geographical and strategic positions, in close proximity to rivers, on ridges, in large river valleys and at lakes, which allowed the inhabitants to be in control over their territory. Small fortresses with ditches or simple trenches were constructed, and provisional campgrounds were maintained. Large settlements were embattled (citadels) by a vast, open, inhabited space around which numerous houses were built next to each other. The Sargat population in the forest-steppe area was primarily focused on animal husbandry and went hunting season-wise. Mostly the people lived with domestic animals, including horses, cattle, sheep and dogs. Horses, cattle and sheep were devoured in gigantic amounts during wakes. Burial sites of two kinds were found: those with straight vertical walls and those clad with ledges. In some pits there was evidence of wood columns made of pines to support a top cover. The sepulchers resembled morgues. Burials of men made evident that the people buried here were warriors equipped with weapons, while women were accompanied by ornamented jewelry, such as pearls and earrings, as well as tools for textile manufacturing and various vessels including bronze kettles. They were buried covered with stone plates and lumber. Fire seems to have played an important role in burial ceremonies. In the southern Ural, singular as well as collective cremations took place in morgues on old burial sites. It is notable how alternate grave-site recognition marks were used within the tribes, like a ring made of stones, surrounded by rocks, or a massive grave stone in the center of the hill. Radially arranged blocks were oriented along the center of the hill, revealing the uniqueness of these burial sites. In other grave sites the dead were placed directly on the soil in a diagonal position. There were also burials of priestesses, i.e. warrior priestesses who were buried with both weapons and religious props. In kurgans (graves) often motives that belonged to eastern tribes were found along with manufactured handicrafts that had probably been imported. Parallels could be observed in the Middle East and the Achaemid Empire (Iran, Ancient Persia): golden jugs, engraved silver with handles showing representations of mountain goats (argalis) and cattle. These were small, “Phoenician” glass vessels and some kind of Middle Eastern vessel made of red clay. One of the kurgans found in the southern Ural contained an Egyptian vessel shaped out of alabaster, displaying hieroglyphs and cuneiform script in four languages, dedicated to “Artaxerxes the Great of the Pharao” (465 to 424 BC). The existence of complex sepulchral structures with different chambers for supplies, horses and guarding warriors indicates to a socially higher developed layer located between the southern Ural tribes and the lower Volga population. Furthermore, some researchers have assumed that a climactic and geographical environment supported such forms, generating tumuli with mounds, particularly in the southern Ural. Similar grave sites were found in the Ural steppe and further east in forest steppes. 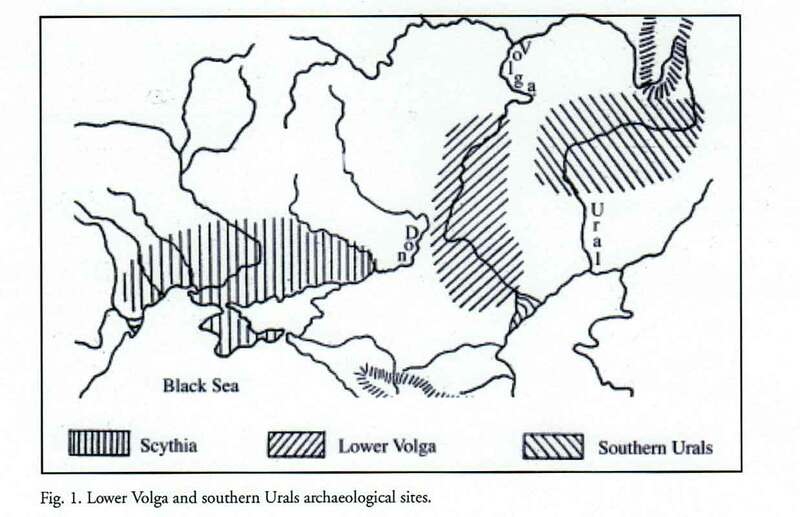 The southern Ural peoples were generally richer and more diverse in their material civilization. They communicated with eastern cultures and nomadic tribes from Central Asia. The southern Uralian population had a more autonomous and complex unity and became a melting pot of influences from other regions. They developed a new form of civilization in this Samara-Ural region during the Scythian epoch in the late 5th century BC. Influences of Sauromatian tribes can be observed. Similar handicrafts found at the lower Volga probably entered this region through migration no later than the 3rd century BC. Pottery and ceramic products were found, whose ornaments were decorated with morphological motives (plant). A style involving plant representations on materials from the Iron Age played an important role in Transuralia. As far as the geographical distribution of these ceramic products is concerned, those at the eastern slope of the Ural Mountains and in the forest-steppe zone were characterized by a great variety of traditional patterns. Also, several steps of development can be identified in this craft of pottery. The motives of the old population of the territory of Transuralia were closely connected to the Sarmatian civilization right up the upper Irtysh river. Most probably they can be identified as of Ugrian origin, the Ugrians being a population that initially settled at the upper Irtysh. 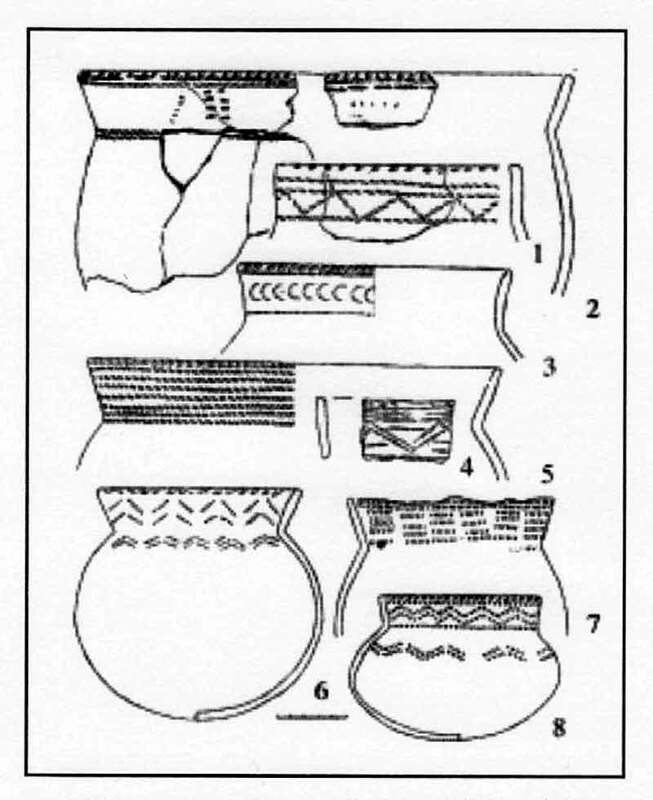 Iron-Age ceramics in Transuralia and those at the upper Irtysh share a number of common features, such as manufacturing techniques, shapes and decorations observed in various finds. Ceramic vessels with vertical-elliptical, spherical or horizontal-elliptical shapes with a round or slightly sharpened bottom were found. Usually, a bottleneck was clearly discernible. A majority of vessels were hand-made using a braiding technique, and fired in open flames. Normally the decorations are found around the neck and shoulders of the vessels. Pottery products were decorated with systematically applied decorative ornaments allowing hardly any variation of patterns or only very simple combinations. As shown by ceramic collections compared to western territories, these decorations had been produced clearly by stamping or scratching. 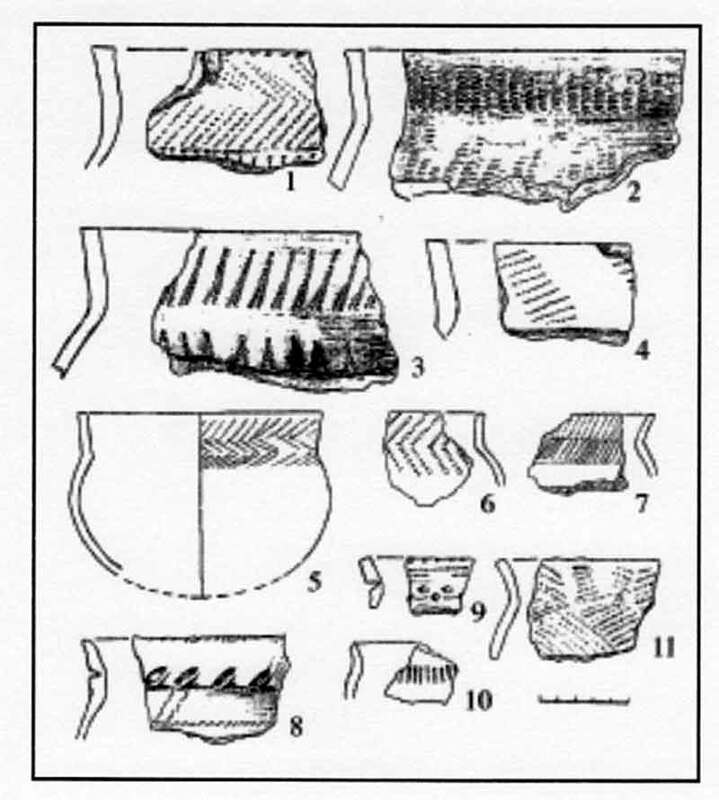 Pots from settlements found in the eastern area are different from those in western territories, where a scratching technique or wedge cutting are predominant in the ornaments. The wedge cutting technique is believed to be the earliest form of decoration and to have been a tradition during most of the Bronze Age. Wedge cutting decorations disappeared and were replaced by the technique of scratching, both at the Tobol and the area of the Iset river. Scratching was later combined with stamping, which was the basis for crest ornaments. 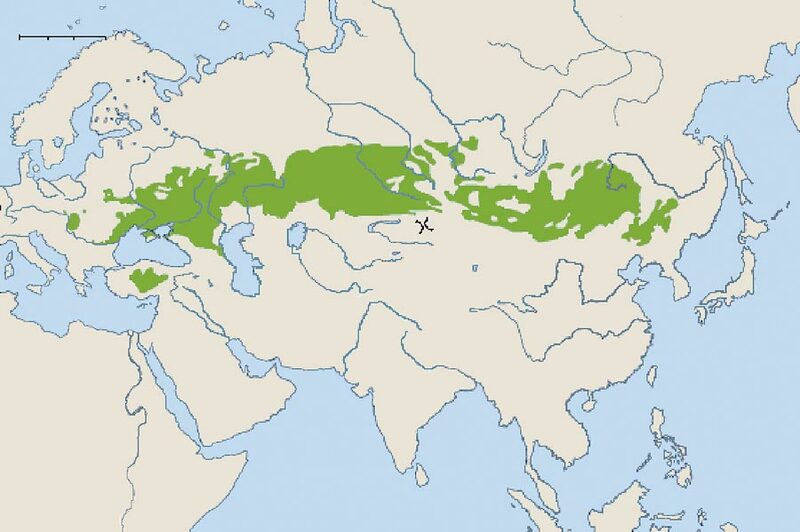 Eurasian steppe peoples settled in a large part of the forest-steppe zone between the Ural and the Irtysh from the 5th century BC to the 5th century AD. These settlements could be both fixed or open. Many kurgans, tumuli and cemetery compounds (morgues) were found. Among the kurgans two separate elites could be identified in burial objects based on their wealth. For example, scepters, bats and bars were important burial objects for the “royal”, or ruling, elite. The warrior elite had weapons in their graves: bows, arrows and daggers, etc. Within their tumuli, the Sargat tribes deliberately opened objects and persons, which reflects not only their social interrelations but also allowed insights into their ritual life forms. The Sargat civilization was a northern variation of the semi-nomadic Eurasian steppe peoples. Kurgans with handicrafts, whose origins were at the Black Sea, in Central Asia, in the taiga and in the steppes, indicate extensive commercial relationships. Transuralia as the northernmost periphery of the Silk Road can be identified as an exterior influence. Burial objects confirm that an elite had access to valuable materials and handicrafts via commercial activities. Under southern influence, a nomadic economy developed in the 7th century BC, and it involved increasing herd migration and the invasion of a group of Saka tribes from the east. Smaller kurgans with central burials were found, which were either designed on the surface with traces of a fire or with flat pits. These graves had eastern-type sheet inserted and contained bronze arrowheads. Nomadic routines were discernible from the funeral rites found among the different tribes in Kazakhstan, the southern Ural and Eastern Europe. During late prehistoric times (around 1000 BC), the previously described steppes were inhabited by civilizations with varying social levels and economic orientations. They included nomads, semi-nomads, shepherds, specialists in metal processing, hunters and fishermen. They had different languages that can all be defined as members of a proto-Iranian or proto-Ugrian language family, as compared to the population who occupied a core of this Eurasian steppe during the early times. It is to be assumed that tribes who settled in these large areas had less contact with settlers in forest-steppe zones and were therefore less able to communicate with them by means of language. Despite exterior influences, a culturally and economically independent system developed in the Tobol-Irtysh forest-steppe region, extending its influence even to the steppes in Central Asia and Kazakhstan. Local clans were in contact with the nearby Asian confederation of states and the nomadic Eurasian steppe confederations. Commercial activities involving handicrafts and cultural exchange in rituals have left traces. These connections did not lessen the individual features within this Scythian culture zone under the Saka and Sauromatian tribes and the Sargat population. Bronze handicrafts in the Uygarak cemetery complexes in Khwarezm from the early Saka period were also found in the Pamir Mountains and the Fergana Valley. Small round bronze badges with loops on the back and leather straps were contained in burial objects and are identical to those in Saka grave sites at the lower Syr Darya river region. Arrowheads  of a so-called “pre-Scythian type”  were common also in the Volga steppe region, at the lower Don and in western Central Asia, especially around the Lake Aral. Small clay lamps are typical of the cemeteries of the Iron Age in Transuralia. The iconography of a frontally standing male figurine is highly typical of the cast Kulay bronze with finds in smelting sites in the taiga of western Siberia, where a large group of people, called the Kulay, was discovered. In this area, bird motives were very popular and sometimes presented in framed pictures. Shepherds grazed their sheep and cattle herds at the Talgar (river), which originates in the high Tien Shan Mountains, in an alpine environment between 2200 and 2890 meters above sea level, with herbs and wildflowers, from July until the beginning of September (seasonal alpine pastures). Every-day life basically consisted of animal husbandry, hunting and fishing. In higher regions, no agriculture was pursued. In grave sites and settlements dating back to the late Bronze Age and the early Iron Age, archaeologists found forms of land exploitation with settlements pursuing an agricultural and pasture-based economy in the lower Talgar valleys. These settlements were located 20 kilometers east of Almaty, the former capital of Kazakhstan. As the Talgar valley is supplied with the melted water of glaciers of the Tien Shan Mountains, it is very fertile. When plowing the fields, remains of destroyed kurgans were discovered, containing handicrafts like ceramic shards and grindstones. Animal bones and ceramic products imply that these were settlement sites. This region was a densely populated oasis during the 1st millennium BC and in the mid-2nd millennium BC. This high density of locations indicates a hierarchy of clan types (kins) with villages, hamlets and smaller, seasonally used camps. The settlements all seem to be oriented towards the southeast, probably as a means of reaching out to the morning sun. A complex that had stone walls and shards on its surface as well as ceramics, grindstones and animal bones was found, probably from the time when the Saka tribes settled. The graves on the opposite site, on semi-dry ground, were removed and replaced by terraces next to minor creeks, e.g. highland terraces; low crests and bridges were also cultivated. This Eurasian steppe culture can be subdivided into an eastern and a western one, where complex grave constructions and memorials were identified. In the lower Volga region, these were influenced by the Scythian epoch at the Black Sea and closely connected to the northern Caucasus Mountains. Zoomorphic representations on round badges with corrugated edges on longitudinal rhomboid arcades were found. Characteristic representations of stag heads with branched antlers on little plates and boar heads are probably directly connected to the Scythian epoch and the animal style. Predators cast in bronze are considered to be either Greek applications from the north of the Black Sea or motives locally influenced by Greek-Scythian art. Typically, the Scythians had similar scale armors (chain armors) and bronze helmets. Almost all the mirrors found at the lower Volga are of the types that were popular among the Scythians as well. There could have been communication between the lower Volga and the northern Caucasus. Influences regarding sword forms can be identified. 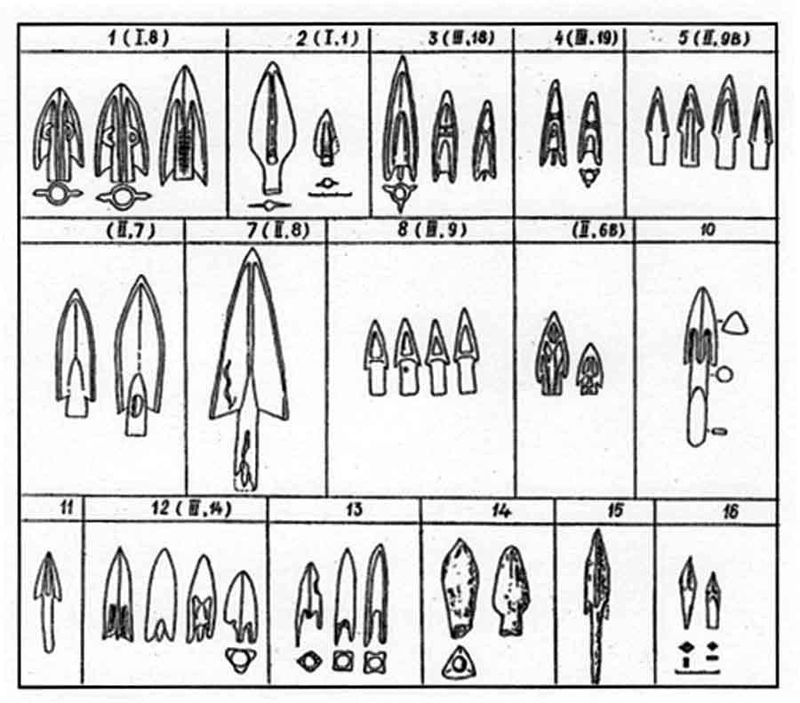 In finds from the right Volga bank and from the Kalmyk steppes, trilobular and quadrilobular arrowheads of this kind, carved out of bones, were found, as were polished vessels from the lower Volga. Burials were similar to those in the northern Caucasus. The discovery of golden earrings confirms that the two regions communicated. Handicrafts such as long and short swords, arrowheads, ceramic products, bead and bronze mirrors and brooches were found in Sarmatian graves as well. Preliminary analyses of these excavations reveal that the Sarmatian tribes cultivated contacts with both each other and the outside world. The early Iron Age in the steppes between rivers Volga and Don is in accord with the history of the Sauromatian and Sarmatian period of the 6th century BC until the 4th century AD. Part of the burial objects were sheep legs with shoulder and ceramic forms, manufactured in rural centers in the Kuban region (Kuban being a river in the northern Caucasus). They contained green enameled alabaster and two handles. This polish was known in northern Mesopotamia as well. Excavations have shown the possibility of a relation to enameled ceramics, whose production site was located in the Medes’ or the Armenians’ territory. This kind of ceramic with a green and blue enamel was used in the steppes at the end of the 1st century BC. This confirms that trade routes from Media via the Caucasus to the steppes of a Sarmatian population existed and were controlled by the Aorsi (Sarmation confederation). Another possibility is that the Sarmatians acquired the knowledge in connection with this polish during the time of military attacks via the Caucasus into the Medes’ and Armenians’ areas. Tacitus Flavius and other writers described such attacks. Immigration by nomads from the east initiated new waves. According to ancient authors, these nomads could have been the Alani and the Massagetae. A continuity of burial rites and a material civilization shows that it was probably still the same population who lived in this region and settled along with immigrants. The handicrafts and the settlements of a Sarmatian civilization extend thousands of kilometers and were interconnected with western Siberia right up to the Danube river. According to opinions of archeologists, the problem can be solved by combining two hypotheses, e.g. by analyzing data from local finds associated with the early population and subsequent changes due to immigration. The beginning of the Iron Age is associated with the distribution of iron in all of Southern Europe, which ends with the Huns’ invasion of the Black Sea coast around 375 AD. The tribes had connections to China in the east by conducting commercial activities with western Roman provinces. The influence of Chinese tradition was high during the Han dynasty, as shown by similar swords with long handles and rhomboid grips made of iron and bronze. We know that during the 2nd millennium BC there was high mobility of nomads in the Eurasian steppe zone, including herds and covered carts wandering through vast territories from China to the Black Sea. The Xiongnu had a strong horse-people state north of the Great Wall from the end of the 3rd century BC up until the 4th century AD. Tribes were displaced westwards from the area of contemporary Mongolia, particularly between the 2nd and 1st centuries BC. These were nomadic tribes, who used to invade the territories of their often hostile neighbors. Events like these caused chain reactions within groups of expellees by undermining or conquering other tribal regions. The Chinese historians Sem Tzan and Ban Gu (early Han dynasty) described how such events took place in the Central Asian area, while authors from ancient Europe point out similar events in Eastern Europe. Strabo, for example, was a Greek historian and geographer, who wrote about large cultural changes in steppe regions. He described newly formed alliances of nomadic tribes like the Roxolani (1), the Siraces (2) and the Aorsi (3). Strabo notes that the Aorsi, who settled in the Don river area, practiced Sarmatian burials at a very early stage at the Aksai river bank. The Aksai is a river in the southeast of the Eastern European lowlands, at the right side of the river Don. Finds of rounded iron belt buckles with a grid ornament show a connection to the Orient among tribes in the Volga-Don region. Similar buckles from the period around the 2nd century BC right up to the 1st century AD are products of the handicraft of the Ordos tribes (4) from an area that is today part of the Chinese territory, whose art was common in Siberia as well. (1) The Roxolani were a Sarmatian tribe residing west of the southern Russian area and the river Don in the Ukrainian steppe area between the 6th century BC and the 4th century AD. (2) The Siraces were neighbors and later enemies of the Aorsi. They migrated from the Caspian Sea to the Black Sea. In the late 4th century BC, they inhabited areas between the Caucasus Mountains and the Kuban region, i.e. the Don river. They were the first Sarmatian tribe to cultivate contacts with Hellenic groups at the Black Sea coast. (3) The Aorsi were the largest tribe in a confederation of Sarmatians. (4) The Ordos plateau is a steppe and desert landscape in the autonomous territory of Inner Mongolia in the north of the People’s Republic of China. The region used to be known also as He-tao, later He-nan (“The country south of the river”). The high plain has an average level of 1200 meters above sea level. Most of this information is found in the works of Herodotus (484 to 430/424 BC), Hippocrates (460 to 377 BC), Diodorus Siculus (90 to 21 BC) and Strabo (64/63 BC to 23/24 AD). These tribes were typical nomads with tents who traveled with wagons all year, taking their animal herds of sheep and horses from pasture to pasture within these steppes. The names of these early Iron Age nomads are found in said ancient Greek tales. “Sauromatian” and “Sarmatian” were collective designations for these independent peoples with similar cultural features of being nomads. They had similar political systems and almost identical burial rituals. Greek and Roman authors mention the Yaziks, the Roxolani, the Siraces, the Aorsi and the Alans as independent Sarmatian tribes. The terms “Sauromatian” and “Sarmatian" civilization have prevailed in archaeological terminology. Herodotus and Darius describe initial invasions into the northern Black Sea region during the Scythian-Persian wars around 512 BC. Herodotus mentions a Sauromatian people living east of river Don and a Scythian population who dwelled west of the Don. Discoveries in Sauromatian kurgans dating back to about 600 BC confirm Herodotus’s statements. Cultic sites from the 4th through 2nd centuries BC were discovered in the Aral-Caspian region in what is today Kazakhstan. Analyses of such sacred sites reveal that they constitute a unique complex of this kind in the entire Eurasian steppe area. Nothing of the like has been found before. These sites share similarities with anthropomorphic statues in stone, stone statues and offering places with the main feature of a round cultic building, and they also share parallels with Zoroastric Dakhma buildings (Tower of Silence with skeletons), although no human bones or burials were found here at all. It is assumed that these sculptures represent dead ancestors (see Sculptures). The discovery of large monolithic altars, known as “offering tables”, suggests that they might have been connected with a cult including fire and liquids. Tamgas (1) were found on several sculptures, they can be attributed to the Sarmatians and the Massagetae (the Massagetae were a northern Iranian horse people). Finds have revealed that nomadic and semi-nomadic tribes have passed this steppe corridor with herds for several millennia. The rocky and sandy deserts between the Caspian Sea and the Aral Lake, on the other hand, remain a blank spot on the archaeological map. Said corridor was of great importance because of its strategic position; it contained the shortest and most direct paths from the north to the Volga, the Ural and northern Kazakhstan, and farther south to the fertile oases of Khawrezm and Bactria-Margiana. In addition, these deserts were also connected to the Iranian and Afghan plateaus. (1) Tamga is a Turkish-Mongolian word for sign: a sign of ownership, possession, mark or signet, also a tribal sign, a clan’s sign, etc. We know that in the Middle Ages, one of the large commercial routes, the Silk Road at the Aral-Caspian Sea, had its own “corridor”, and that this path from east to west had been in use much earlier. Archaeological researchers have identified finds from the Neolithic Age in the Aral-Caspian region. Historical sources describe how the nomadic tribes of Central Asia and the tribes in the Kazakh steppe played an important role in the exchange of commercial goods with caravans. The routes were later used in the 1st millennium BC after the collapse of the empires of the Achaemenids (1) and Alexander the Great. (1) The Achaemenid Empire (also known as Ancient Persian Empire) was the first great Persian empire. It lasted from the late 6th century BC to the late 4th century BC and extended over the territories of the contemporary states of Iran, Iraq, Afghanistan, Uzbekistan, Turkey, Cyprus, Syria, Lebanon, Israel and Egypt. The Achaemenid Empire first expanded under Kyros II. by annecting the Mede empire. Kyros’ successors continued the expansion until the extension reached its apex around 500 BC, when the empire comprised parts of the countries of Libya, Greece, Bulgaria, and Pakistan as well as areas in the Caucasus, in Sudan and Central Asia. In 330 BC, Alexander the Great put an end to the Achaemenid rule. Archeologists have discovered sacred sites in the Ustyurt Plateau (see map) and in the Aral-Caspian region between Kazakhstan and Uzbekistan; they were located on hills or hill-like embankments with up to 35 stones with anthromorphic statues, round and rectangular stone altars and dozens of small stones suggesting memorials or places of offering. The tribes of the Sarmatians, the Saka and the Massagetae who settled in the western Asian steppe were once believed to be familiar only with an animal style. Their cultic buildings, however, showed parallels to Zoroastric Dakhma buildings (Tower of Silence with skeletons), although no human bones or traces of burials were found. Based on the sculptures, it became clear that these groups of statues must represent ancestors or gods (see sculptures). The statues were rather skillfully manufactured, showing that the stonemasons of the time had excellent “stone-processing skills”. The precision with which the objects were set in stone and executed in great detail allowed them to be authentically reconstructed in order to be able to identify the appearance of these early inhabitants of the Aral-Caspian steppe. Usually, each sculpture illustrates a standing male whose right arm is lowered and whose left arm is pressed against his belly. The faces are full of expression, with almond-shaped eyes, a forehead clearly separated from the face and a straight longitudinal nose with a thin, pendant moustache and a small mouth. Although the majority of sculptures reflect European facial features, others have a broad and flat face and lack beards or defined cheekbones. These features are characteristically mongoloid. Note that paleoanthropological studies have shown that the peoples who lived in the eastern region at the Caspian Sea during the early Iron Age belong to a Caucasian-Mongoloid mix. Their apparel and accessories are also mentioned: a broad leather belt with a metal buckle, sometimes decorated with embroidery or applications. A double-edged sword in a sheath at the front belt, pending by two straps, a quiver fixed on the left side of the belt, and a bow of the type used by the Eurasian nomads during the Scythian-Sarmatian period; then a dagger suitable for both hunting and fighting. This seems to be the representation of an Ustyurt nomad warrior settling here. Carvings in the statues’ daggers show that they were similar to the “Saka-Median” tribes and worn at the hip by one or two straps. An extension at the end of the sheath, or a couple of ledges attached to the bottom part of the cover, prevent the dagger from falling out. The dagger had to be positioned close to the warrior’s hand. 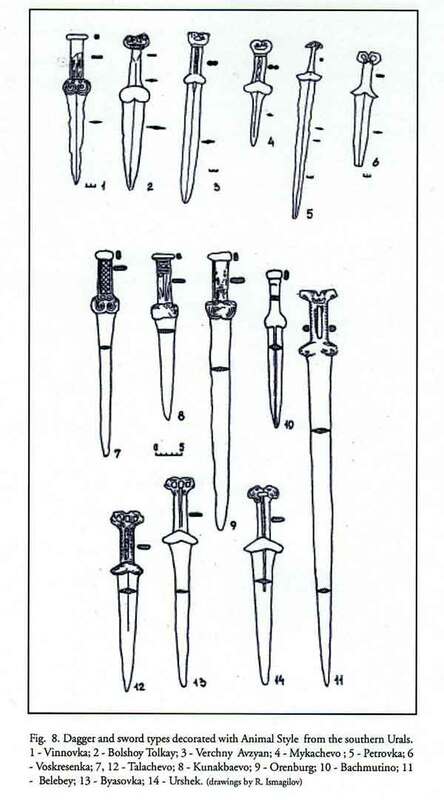 It is known that the Medians, the Sarmatians, the Saka and the Massagetae wore such daggers in the same way, however, it is not fully known how the Scythians carried their weapons at the time. A semi-spherical leather helmet protected the head and neck of these nomad warriors. Objects of noble metal revealed the high social status of their bearers. Persons of higher rank (both men and women) wore gold jewelry, including bracelets, earrings and ornamented decorative trinkets. The nomads also decorated their harnesses with silver badges and beads. In addition, helical ornamented trinkets, earrings and bracelets with relief structures were found; this was fake jewelry found also in nomad graves in the Volga and Ural regions, and in Kazakhstan. It is assumed that tomb raiders re-sold these handicrafts from graves in southern Siberia and northern Kazakhstan. The Sarmatians, the Saka or the Massagetae also produced such anthropomorphic structures, however, it was generally known that they preferred to place stone stelas or menhirs in their grave sites and mythical places. As it seems, only their western neighbors  the Scythes from the northern Caucausus and the Black Sea  created this type of anthropomorphic sculptures for the first time. Scythes also reproduced images of standing male warriors, but their weapons and decorations were of a different kind than the sculptures and statues found on the Ustyurt Plateau. The Scythian sculptures appeared in the late 7th or early 6th century BC, much earlier than the Ustyurt sculptures. It seems unlikely that Scythian sculptors should have influenced the Aral-Caspian region. What did those stone sculptures imitate? Or was a sacred center of the microcosm (the territory of the sanctuary) represented, as such sculptures were put up in a central position of every sacred site? It is known that the eastern and southern sectors of the Indo-Iranian or Indo-European mythological concepts are usually dedicated to a theme of life, like regeneration, the light or the sun. Reconstruction has revealed that the statues were placed towards the north or west. In Indo-European religious concepts, this was the direction of dawn, of the mythical “Land of the Dead”, where the cold and the darkness lived. The altar tables and their indentations were constructed in a way that allowed their use with liquids, water, or blood as well as fire and animal fat, which was eventually ignited. We know that priests in the ancient Indo-Iranian civilizations were familiar with those rites, which were also practiced by the Sarmatians, the Saka and the Massagetae  these rituals were associated with humanity, nature, death and resurrection. People believed that priests, using magic, were able to reconstruct a world order that had been violated by a person’s death or a major catastrophe; priests could ask the gods for help in the fight against imaginary or real enemies; they also paid tribute to the ancestors and gods and organized ceremonies to produce the rebirth of the mental and physical power of the community. This is probably the reason why this large number of sculptures with similar facial features were created in series. This, again, allows the conclusion that they represent deceased warrior ancestors who were paid tribute to by the tribal community. What is also possible is that each statue was created as a keeper of the soul of dead warrior ancestors. Sculptors pointed out their military importance and also their individual personal characteristics like advanced age. They were ever-present for posterity, so the successors could ask the ancestor’s spirit for help in desperate fights with Greek Macedonians and their allies in the southern region of Ustyurt. The military leaders of each tribe were honored as living embodiments of a mythical heroic tribal father and guardian of the tribal territories. The statues were equipped with weapons. A large variety of carved daggers, swords, decorative plates and bracelets were identical to those of the Ustyurt statues and found in Sarmatian graves from the 4th through 2nd centuries BC. Objects and their representations from excavations have exhibited parallels to Ustyurt statues identical with finds of handicrafts from the Eurasian steppes. Mostly, these tomb groups existed in the north of the Ustyurt Plateau, in the Black Sea area, along the Volga and the Ural Mountains and in northern Kazakhstan as well as in the south, in the area of Khawrezm and Sogdia. Weapons, harnesses and household goods were found everywhere across the steppe zone and used independent of ethnic origin by all groups. As a result, it is not possible in this case to attribute the majority of manufactured handicrafts, like weapons, jewelry, tools and ceramic vessels, to certain ethnic groups as reliable indicators. 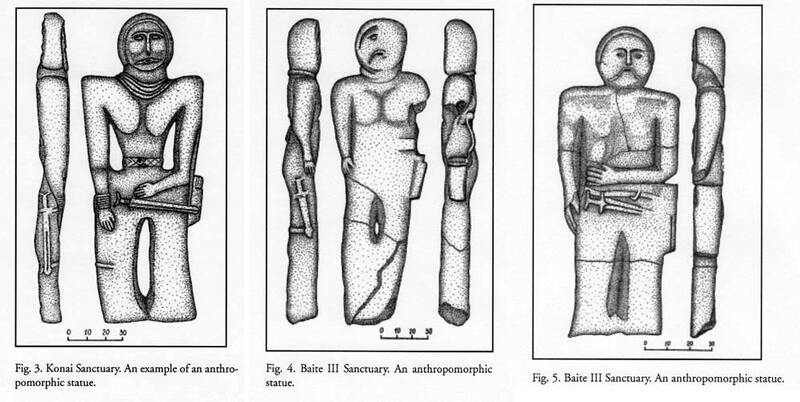 The anthropomorphic statues and rectangular offering altars, the typical stone sculptures at the Ustyurt Plateau, these sanctuaries were not found in analogy to neighboring nomadic civilizations. They are heroic symbols from the 1st century BC. The use of monumental statues installed in series is similar to the tomb groups mentioned. Sanctuaries were found in the vicinity of kurgans in southeastern Anatolia. Note how vividly present the Greek civilization with its monumental arts was in Anatolia. The tamgas (tribal signs) on these anthropomorphic statues were however added at a later point in time. This statement is confirmed by the fact that they might be derived from a Sarmatian population who only temporarily settled in this region. Based on historical sources, their identity could not be determined for sure. Information in Chinese and classical texts on the inhabitants of the Eurasian steppes is often conflicting and contains material from other oral sources on how nomads in Central Asia during the 2nd millennium BC were represented. These texts, however, served as valuable sources for information that can be compared to finds in graves. 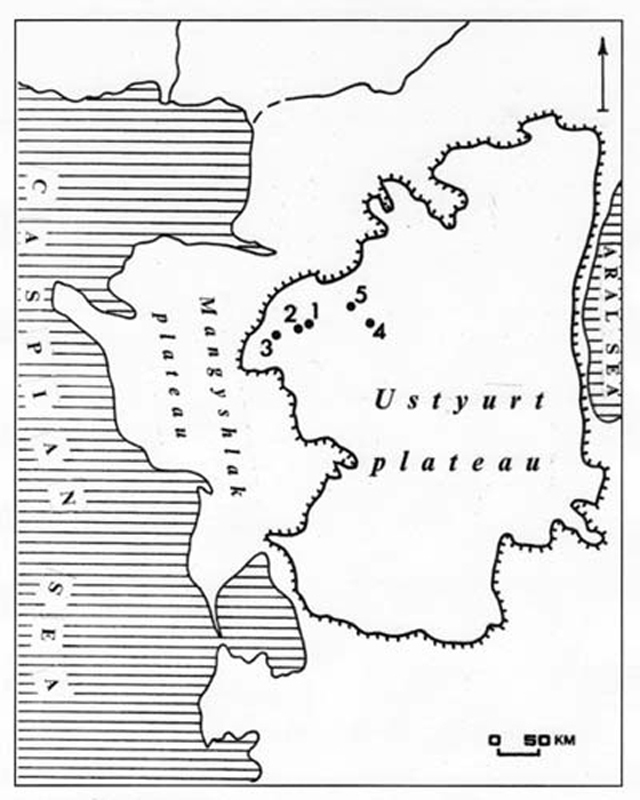 Critical analysis of written sources has enabled us to identify an inhabited zone of Sauromatae and Sarmatians in these steppes at the Volga and in the southern Ural, which was established during the early Iron Age from the 7th to the 3rd centuries BC, at the time of the Saka, the Massagetae (Dakhi, Dai  1), the Scythians and a number of smaller tribes in the steppes and half-deserts at Lake Aral, in Kazakhstan and Central Asia. (1) The Dakhi (Dakha) or Dai (a variant of Dakhi) settled at the Aral Lake and in the eastern region at the Caspian Sea. Some ancient historians viewed the Dakhi-Dai as part of the Massagetae (Dakhi-Massagetae). All these civilizations pursued a similar lifestyle; they were warriors on horses, hunters and nomads who wandered around with herds. They were feared for their belligerence and love of freedom. Archaeological data indicates that the majority of the nomads in the Eurasian steppes used essentially the same weapons, decorative art forms and household objects. The second half of the 4th and the early 3rd century BC was a time of vigorous political, ethnic and cultural upheaval throughout the ancient world, a time of fighting and great mingling of European and Asian, culturally independent peoples and traditions. This period is also associated with the Macedonian king Alexander the Great, who conquered the Achaemenid Empire (Persian Empire) in 331 BC. Countries in the Middle East and Central Asia were brought under subjection. The Greeks did not only enter the east as conquerors but also as bearers of a Hellenic civilization with a culture different from that of the Ancient Orient. The Greek language became the lingua franca in interregional communication, while the regional tongue prevailed in the local population. A large part of Greek literature, mythology and art was spread in the east. Mixed marriages became commonplace, Greek monumental art impressed the nomadic peoples and their leaders. It is very much possible that anthropomorphic sculptures of Hellenic gods and heroes were of some influence, inspiring the nomads to create their own anthropomorphic sculptures with the additional protection by ancestors. Some nomadic tribes waged some kind of guerilla war. The ancestor-hero cults were popularized. Military bravery and weapons were supported with the concept of consolidation of forces, in order to fight against invaders. The extreme climate conditions were incompatible with the rapid development of an economy based on husbandry, as they posed a constraint of their progress and population growth. This caused seasonal migration without serious enemies in the Aral-Caspian area, where they looked for new pastures in the northern Caspian zone, the north of Kazakhstan, or the southern Ural. Maybe they even migrated westwards, to the Mangyshlak Plateau, where the climate was better and where they were able to arrive with less effort.